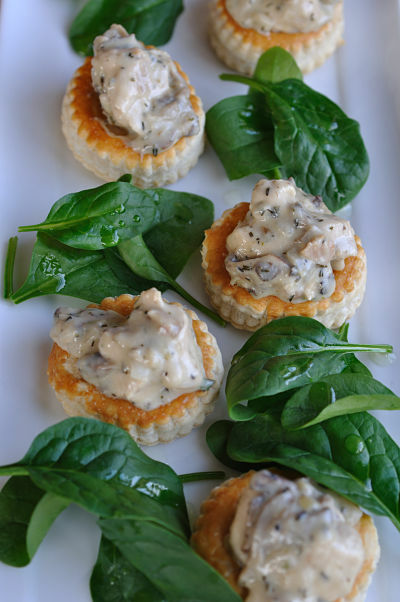 So when’s the last time you had a chicken & mushroom vol au vent then? Perhaps as a starter at an ’80s or a ’90s wedding and pretty much banished thereafter. In Ireland we travelled throughout the late ’90s and early millenia years and our tastebuds travelled too. We brought back a longing for Tapas from Spain, Olives from Italy, Charcuterie from France, along with Terrines, Pate, Confit, Chorizo, Salamis, Jamon Serrano, Prisciutto di Parma, Jambon de Bayonne, Tapenades, Sundried, Semi-Sundried & Sun-blushed tomatoes. And that’s just from Europe. Those who explored Australia and Asia returned with an entirely different shopping list, they were exploring fusion cooking and looking for chillies, lemongrass, coconut milk, nam pla, kaffir lime leaves not to mention the spices of India, and what about those who ventured to South America & beyond? Suffice it to say, it’s been a while since I’ve had a longing for a pastry case filled with a creamy chicken and mushroom filling. Served as a starter or as a main this is scrumptious, nostalgic fare. Great served with a side of salad leaves or boiled rice. (You could posh this up by using cream instead of milk.) For a dinner party consider making the filling the evening before and then reheating it on the night to fill freshly baked cases. Serves 4 hungry people but could stretch to 5 perhaps! Heat the oil and butter together in a frying pan over a medium heat. Peel and finely chop the shallots and soften in the pan for 5 to 10 minutes. 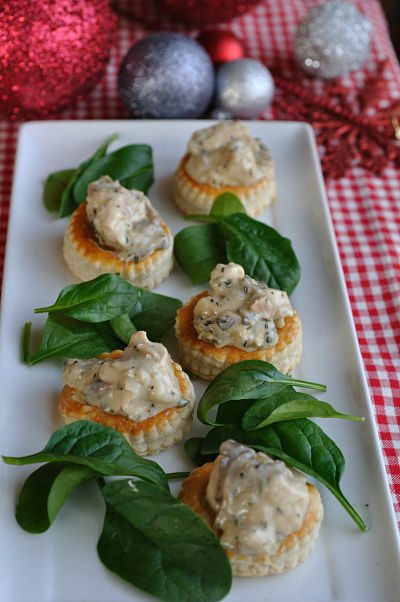 Place the vol au vent pastry cases in the oven and cook according to instructions on the pack. Chop the chicken breasts into chunks and add to the pan with the thyme and cook for 10 minutes. Rinse and chop up the mushrooms and add to the pan, cook for 2 minutes. Add the 2 tbsp flour to the pan and stir to form a paste that coats the chicken and mushrooms, cook for a minute or 2. Gradually stir in the milk and water and raise the heat until just under the boil and then reduce again. Allow to thicken for 5 minutes more. Fill the pastry cases with the chicken and mushroom filling. Could I make the filling and then feeze it?